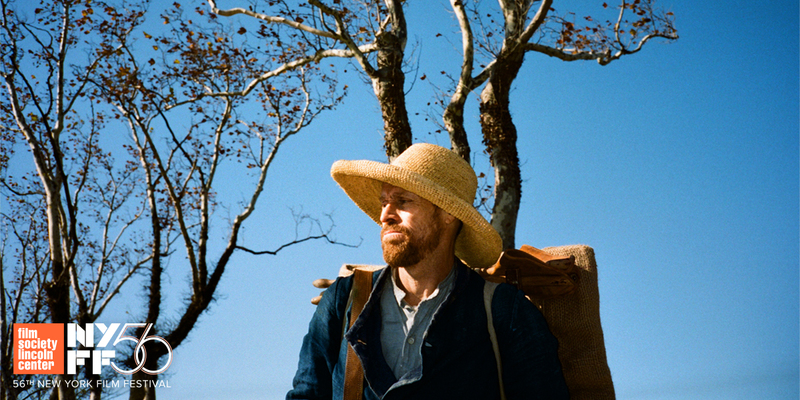 Nominated for Best Film at the Venice Film Festival earlier this year, At Eternity’s Gate (named for a painting of Van Gogh) will close the 56th Annual New York Film Festival. Directed by Julian Schnabel (Diving Bell & the Butterlfy), starring Willem Dafoe as Van Gogh with Rupert Friend and Oscar Isaac. Julian Schnabel’s ravishingly tactile and luminous new film takes a fresh look at the last days of Vincent van Gogh, and in the process revivifies our sense of the artist as a living, feeling human being. Schnabel; his co-writers Jean-Claude Carrière and Louise Kugelberg, also the film’s editor; and cinematographer Benoît Delhomme strip everything down to essentials, fusing the sensual, the emotional, and the spiritual. And the pulsing heart of At Eternity’s Gate is Willem Dafoe’s shattering performance: his Vincent is at once lucid, mad, brilliant, helpless, defeated, and, finally, triumphant. With Oscar Isaac as Gauguin, Rupert Friend as Theo, Mathieu Amalric as Dr. Gachet, Emmanuelle Seigner as Madame Ginoux, and Mads Mikkelsen as The Priest. The 17-day New York Film Festival highlights the best in world cinema, featuring works from celebrated filmmakers as well as fresh new talent. The selection committee, chaired by Jones, also includes Dennis Lim, FSLC Director of Programming, and Florence Almozini, FSLC Associate Director of Programming. Earlier this summer, NYFF announced Yorgos Lanthimos’s The Favourite as Opening Night and Alfonso Cuarón’s ROMA as the Centerpiece selection. This year’s gala screenings, including Closing Night, will be held on Fridays instead of Saturdays. Tickets for the 56th New York Film Festival will go on sale to the general public on September 9. Festival and VIP passes are on sale now and offer one of the earliest opportunities to purchase tickets and secure seats at some of the festival’s biggest events, including Closing Night. This entry was posted in Film Festival, New York Film Festival and tagged at eternitys gate, diving bell & the butterfly, julian schnabel, nyff, nyff56, nyff56melissa, oscar isaac, Rupert Friend, van gogh, Venice Film Festival, vincent van gogh, Willem Dafoe by Melissa Hanson. Bookmark the permalink.